Al Weinrub one of the founding members of Science for the People,opened the plenary with a discussion of their inspirations as one of the founding members in creating Science for the People. Weinrub credited the anti-war movement, the civil rights movement, and various radical groups throughout history with having profound influence in the creation of Science for the People. Carol China recalled the influence of Three Mile Island in here level of activism within the movement. She recalled the intensity of the activism as broad to many in society because “everyone was subject to the dangers of it, it was not far off, it was right in out laps” . But recalled her own activism as non-stop “from he time I woke up to the time I went to bed”. 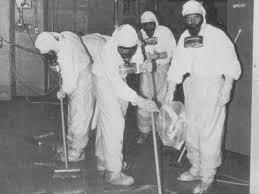 Three Mile Island Nuclear disaster. Herb Fox retold many humorous stories from the movement including his experiences with FBI surveillance. In one experience, he could actually hear the FBI breathing on the other end of the telephone. These stories and others describe the extent to which science for the People interacted with government authorities, namely police and the FBI. Next, Britta Fischer shared the conflicts and obstacles for members of Science for the People and the organization as a whole within a larger political climate. She expressed the struggles of the organization against society, other organizations and the political system. Additionally, she recalled her unique role in the movement, by purchasing a house in Boston which was used primarily for the magazine. Terri Goldberg shared her experience working on the Science for the People magazine. She stressed the level of work that was put in by both paid and volunteers in the magazine through writing, illustrations and production for long hours. Goldberg offered a different perspective of the other members as she was not a early member of Science for the People, and experienced the shift towards a more liberal ideology within the organization. 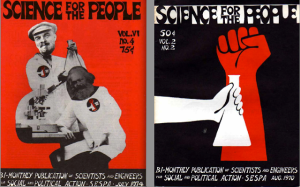 Two issues of Science for the People magazine from 1970 (right) and 1974 (left). Michael Goldhaber closed the panel a discussion on what influenced him to join the movement. He expressed that the ways in which science was used for war and the age gap between older members who trusted the government and hunger members who were against the was. Goldhaber even in his own work, expressed the desire to remain ignorant of any government secrets and to this day, holds the secret of the hydrogen bomb.